I'm searching for a certain pathfinding algorithm which considers a certain sort of branch in the network. However, I find it difficult to define my search term as I do not know how this certain kind of edge is named. Have a look at the image, the red circled branch. How to name a branch of which one of the two nodes is only single connected, in other words, one node is integrated in the network by only one connection? 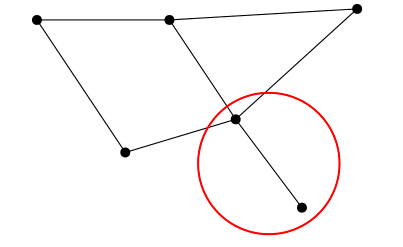 Usually, in a network, most nodes are more or less 'intersections', meaning they connect two edges. However, in the image, you see that one edge 'sticks out', like a street ending in nowhere. Sorry, if the answer to this question may be to some of you very natural, I'm very new to this topic. This question relates to my other question ('Yen's or Eppstein for path with intermediate destinations with 'dead ends'?'). I think the term 'dangling edges/nodes' is what I was looking for in my case. However the answer to this question seems to depend on the field of interest. Within ArcGIS applications such branches are named dangling nodes/ or dangling edges (for example https://desktop.arcgis.com/de/arcmap/latest/extensions/data-reviewer/finding-dangles-on-line-features.htm). However, other terms are also used, for example 'hanging edges' or 'redundant edges' (e.g. see Ying et al 2011, https://www.fig.net/resources/proceedings/2011/2011_3dcadastre/3Dcad_2011_21.pdf). As such, for the above given example there are a variety of terms possible as there is no official standard term. Not the answer you're looking for? Browse other questions tagged routing network terminology or ask your own question. How to route over (partial) edges in pgrouting?